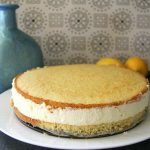 A lemon mousse cake that is simple to make as well as being low carb and gluten free too. Beat the egg yolks with the erythritol. Add the vanilla extract, baking powder and coconut flour. Whisk until combined. Pour into the cake tins and bake for 15 minutes until golden and firm. Heat up the lemon juice, add the gelatine (or agar agar) and rind and stir until combined. Beat the eggs with the erythritol. Add the lemon mixture and stir well. Fold the cream into the lemon mixture and stir well. Place one sponge in the bottom of the spring form cake tin. Pour the mousse on top and spread out evenly. Place the other sponge on top of the mousse gently. Put into the fridge for at least 4 hours, allowing the mousse to set. Remove the cake from the spring form tin.